Recently I was on facebook going through all my groups removing myself from ones I had no interest in and finding some old ones I hadn’t been in for a while. I came across a dollar tree group and decided to take a look. I have always just gone to Dollarama and didn’t think Dollar Tree was a big store in Canada but turns out we have quite a few of them! I started going to them recently and found all the treasures. So I was really excited to see this Dollar Tree group, I went in and got hooked. 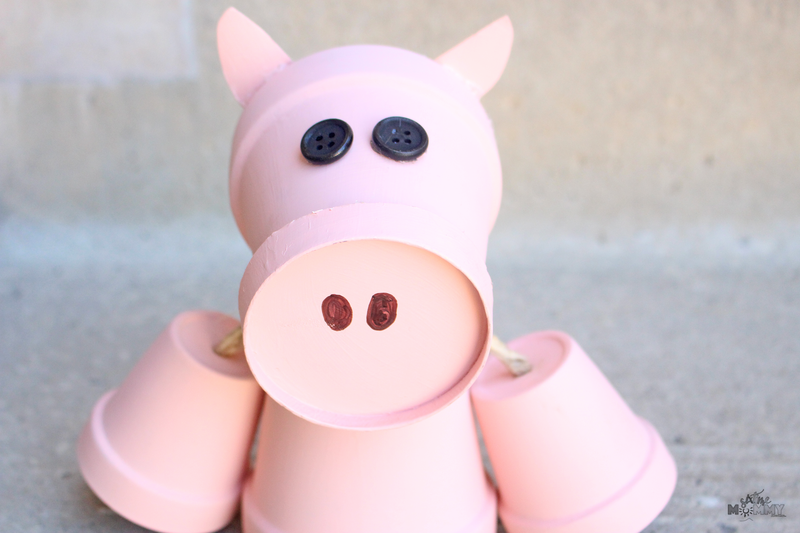 People started posting their fun crafts from using Dollar Tree items and one thing people kept posting were terracotta pot cows. I thought, how cute are those? I needed to try. 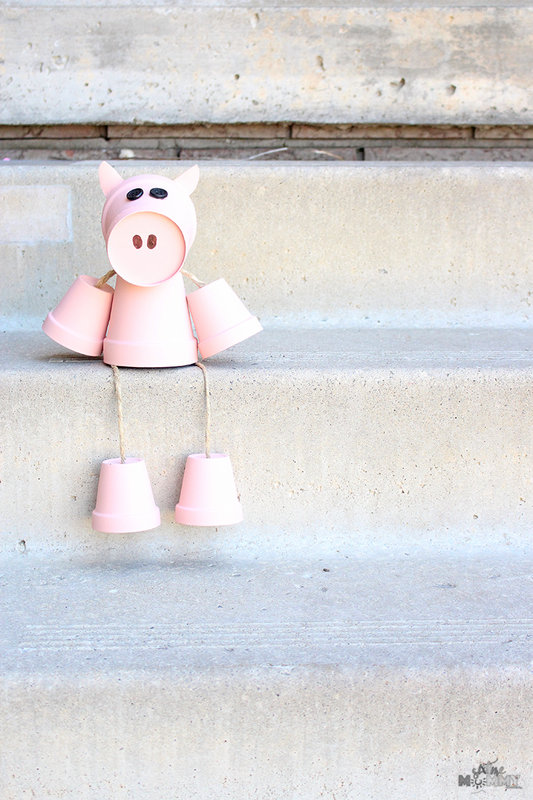 But, I wanted to be a bit different and do something other than a cow – so I decided on a pig! I went and got all the things I needed, and couldn’t find the proper part for the nose everyone else was using so I had to improvise. Instead of using the bottom tray of a terracotta pot I used a sturdy paper ice cream bowl. 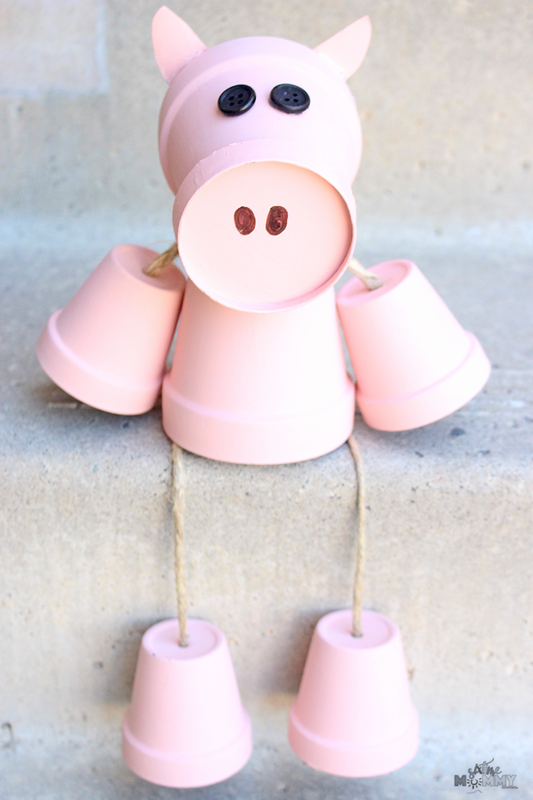 I painted it, cut it and fastened it on – it worked and turned out so cute! This is pretty simple, but because I’m super picky I wanted to make sure everything turned out just perfect on my piggy, and it took a little extra time. The painting of the pots is what took the most time as I had to do two coats, and some parts I did three on. I did that the night before assembly, and it worked out great as it was all dry and ready to go! 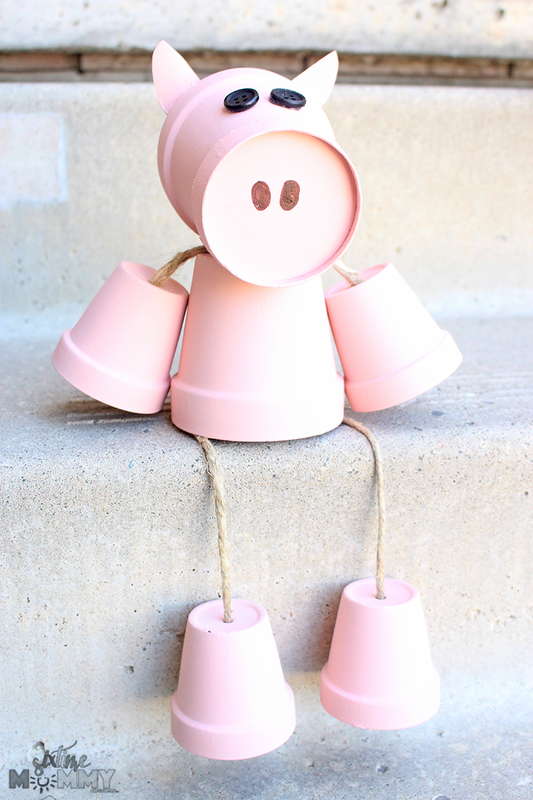 The night before assembly, paint your terracotta pots. Do one coat, let dry and then do another coat. Let sit overnight. Cut your twine to size, attach to two small terracotta pots for arms and glue into body terracotta pot hole at the top. 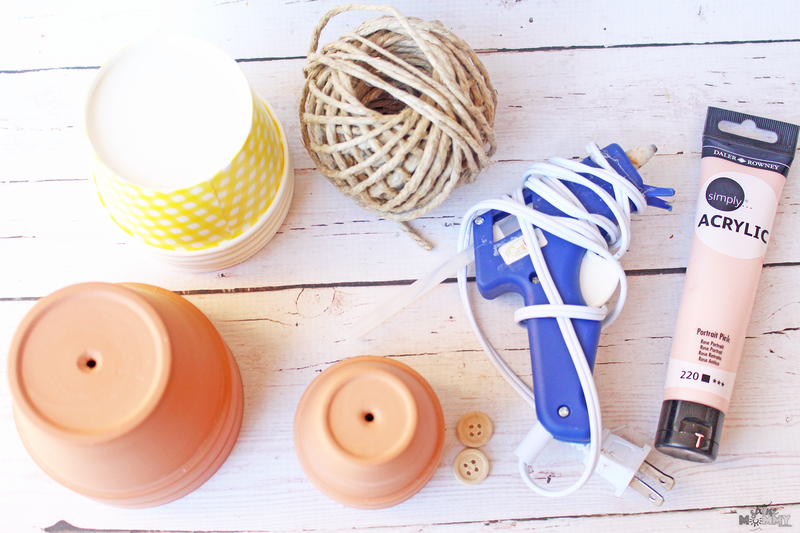 To fasten the arms to the twine knot really good through the top holes of the small terracotta pots. Once arms are glued to the top of the body (medium terracotta pot) you can now glue the top/head medium terracotta pot into place on top of the body. Once that glue is set you can now turn over your body and do the same with the last two small terracotta pots and twine for legs. This time glueing inside the bottom of the body at the sides to let the legs hang out of the bottom. 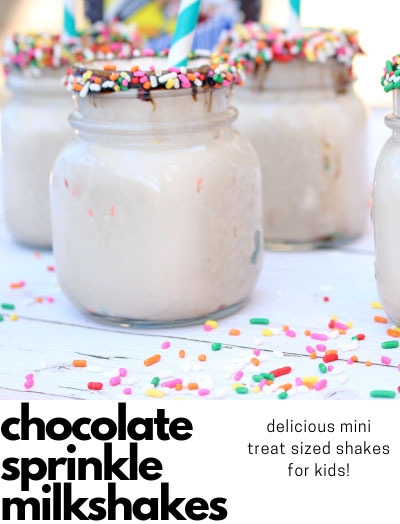 While your glue is setting take your sturdy paper ice cream bowls and cut out the bottom. Draw on two dots for nose holes, and glue onto front of the face with your glue gun. Take your two buttons and glue them into place on the face. Now you are DONE! Once finished you can leave as is or spray if you plan to put outside so that it doesn’t get ruined being outside in different weather conditions. I am just obsessed with it. I think it turned out way cuter than I ever imagined. Justin, our 4-year-old is loving it so much he named it Marshall! He also wanted me to get a photo of him sitting with Marshall when I was taking photos for this post! I am planning to use this method to make different animals to display on our front porch. I want to either line them up the stairs or get a small table to sit on my porch holding one or two. My next one will be a bear, and my husband wants me to help him do up a tutorial for a chef person. How much fun will that be? I’ve already gotten comments and people asking me where I got him, so I know he will be a hit! 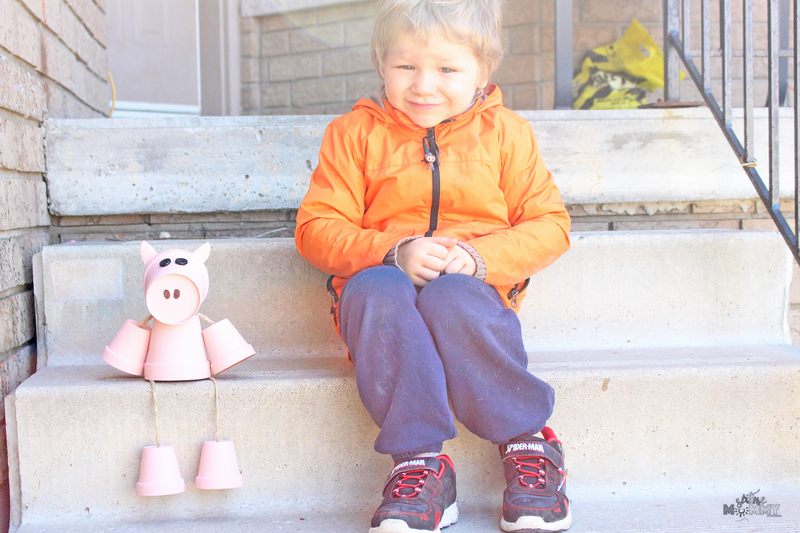 All the items I used to make him came from the dollar tree except the pink paint – I couldn’t find any at ours, so I had to grab that at Walmart. 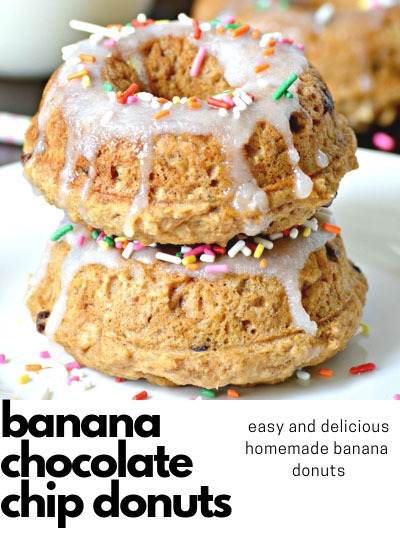 This project is so easy, if you are looking for something cheap, fun and the end result being so gosh darn cute this is a fun one to do with kids! 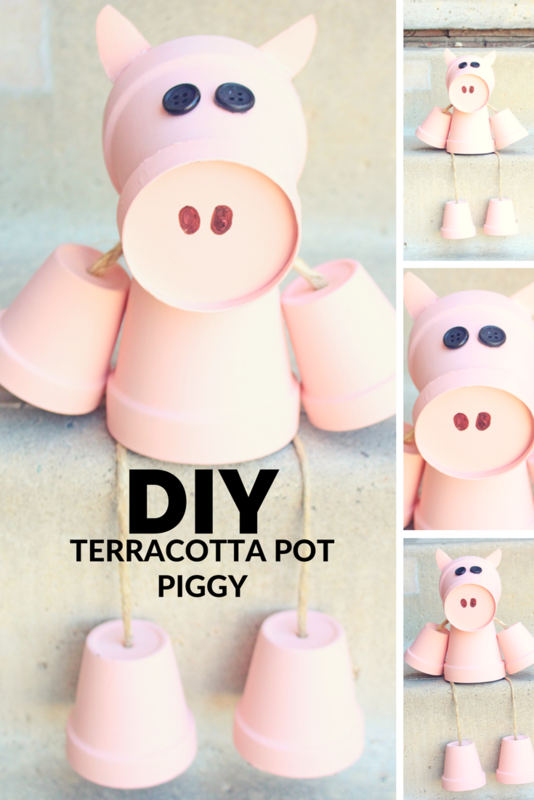 I am actually looking forward to grabbing some more terracotta pots and letting my kids make some animals of their own. I’m a bit nervous to try the people I see others creating because I am really not that good at drawing or being crafty, but I think I will try my hand at a few different options. 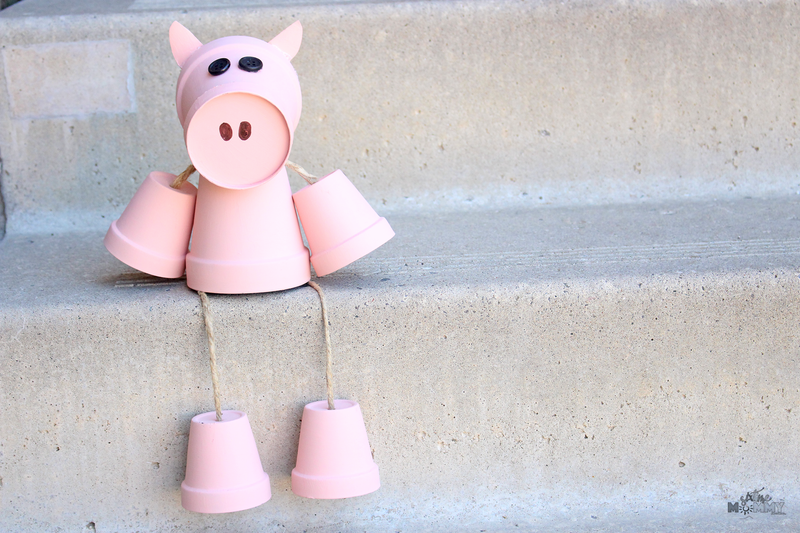 If you aren’t sure what you’d like to create and aren’t really a fan of the pig the options are endless. You can take away the legs too to make a cute little table or counter animal, and one I’d like to try next is one I can actually keep a plant in the top of. If I succeed at that I will share. Hopefully, you enjoy this piggy as much as I do. I’m pretty proud of how it turned out considering I’m not very crafty at all! Happy Crafting!